Shortly after my husband and I got married, we put together a picnic dinner. I was so excited to make a delicious quinoa salad. We started eating, and I noticed my husband wasn’t eating any of my salad. I asked him, and he said he doesn’t care for salads like that. I had just bought a big package of quinoa, and I needed a new way to fix it. I found lots of recipes for casseroles or soups, but not many regular side dishes. So, I finally took a salad recipe to make this side dish. And it turned out great. This is great with fish or chicken. Or stir in some chicken and make a meal out of it. Enjoy! 1. If not already cooked, cook quinoa according to package directions. 2. Heat olive oil over medium-high heat in a large skillet or saute pan. Add celery, carrots, onion, and bell pepper. Saute 5-7 minutes, until vegetables begin to be tender. 3. Mix together remaining ingredients in a small bowl. It is not essential that they combine perfectly. You can heat it in the microwave for 15-30 seconds and they will combine better. 4. 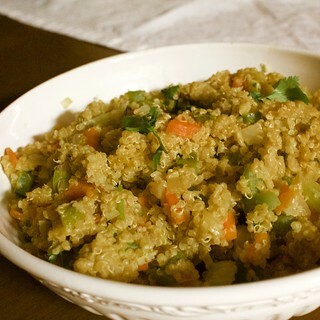 Add quinoa and peanut butter mixture to vegetables. Stir and cook until well combined and all is heated through. Serve. Recipe notes: You could substitute any vegetables you like. The “sauce” is pretty thick. You could add in some water or more soy sauce to thin it out more, if you like a saucier side. I liked mine fairly thick, almost like a fried rice.